Test your surface mount soldering skills out, starting with a 1206 package and work your way down into an oblivion of frustration. In trying to design a beginning surface mount kit, I began to wonder just how small a surface mount part you could hand solder. 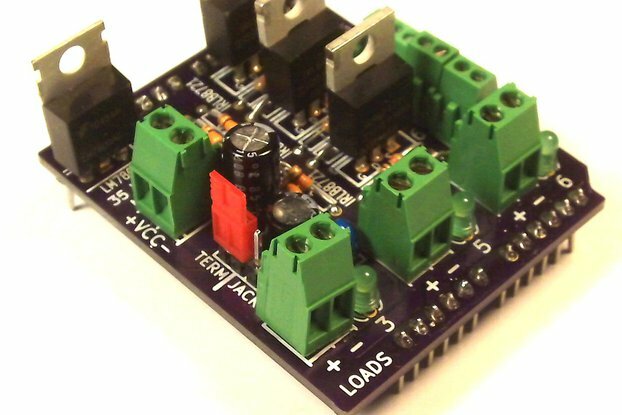 This project, as titled on Hackaday.io, "An Unfortunate SMD Project", is ultimately designed to make you fail. In case you didn't read the above description, let me reiterate: I can almost guarantee you will fail, even though I provide extra components so you can take more than one try. Should you succeed, and that, as stated above, is unlikely, you are eligible for inclusion for the exclusive 0201 Club and a digital copy of a Certificate of Membership. The Misery Edition starts with 0805 packages and a QFN20 chip which is much harder to hand solder. Since I haven't found a 01005 LED yet to match the 01005 resistor, you get another 0201 LED, but this one is diffuse so you can't tell the orientation visually. On the plus side, it has a switch to save battery power, and will indicate if a LED is installed backwards. Data sheets for the LEDs to determine orientation. A lot of patience, persistence, and a positive attitude! I would not recommend this kit to anyone, and am just selling it to punish the Hack-a-day folks who love such frustration. 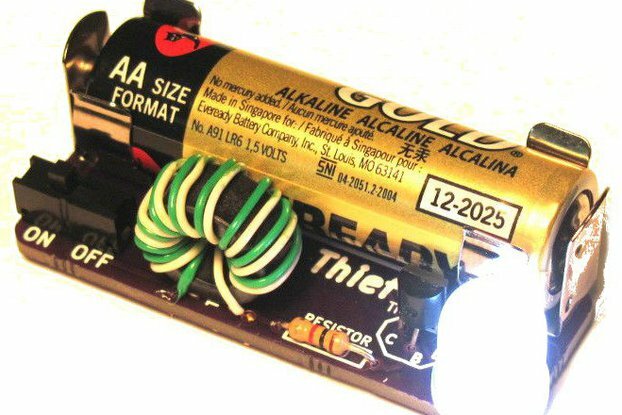 If you are learning how to solder, I would recommend my Easy Joule Thief Soldering Kit. 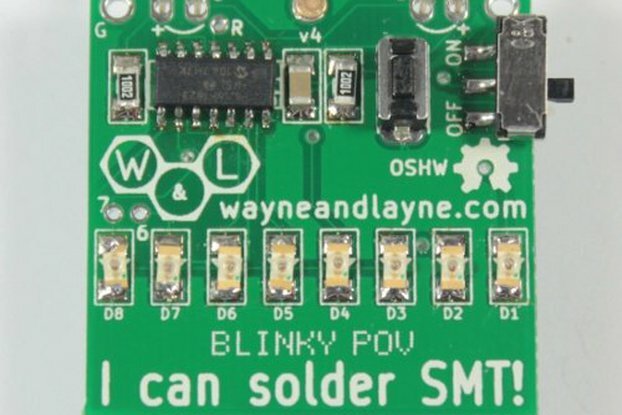 If you are interested in learning how to solder surface mount components, I would recommend my I Can Surface Mount Solder Kit. If you are interested in doing these for a large group or event, I'm willing to help you customize the silk screen or programming. Exactly as advertised. I chose the misery version. The ic chip has a pad directly beneath so i used a hot air gun on that one only. Messed up the 0603 led so I simply bridged the connection. The 0201 and 01005 I used my microscope. They supply a 2nd set 2nd chance on the smallest resistor and led. 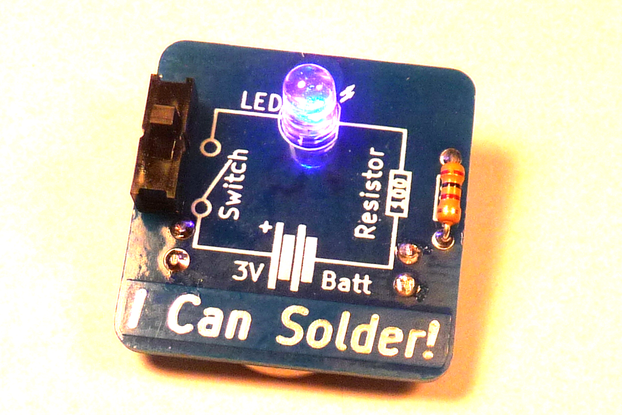 The smd kit challenge is a great way to test your soldering skills. but what would have made it even greater is if all the components (leds and resistors) where 0201 for those of us who want a really good challenge so as to improve those skills and challenges that we rarely face in soldering for a hobby. i wish the pcb had a key ring case so as to protect it from being shorted from any metal from any keys which it might come into contact with. perhaps tindie might look into doing something like that. being in the UK the delivery seemed to take for ages. maybe selling your product on amazon might make things a bit quicker. i really enjoyed putting the components on the pcb but once the 0201 components where soldered down all the rest seemed a breeze to put on. if you really want to challenge us tindi give us components (resistors and caps) with them all being 01005. this will i feel will really challenge those of us who take their soldering seriously and enjoy improving their skills in the art of soldering. great kit, but short lived challenge when the 0201 components where soldered down. I did have some experience hand-soldering 0603 parts, so I said to myself: "This can't be _that_ difficult…"
Well, going to 0402 was a challenge, and soldering the 0201 parts was brutal. But, much to my surprise, everything worked at the first try :) Didn't even need the "second change" parts! For anyone interested in electronics and soldering I can only recommend accepting this challenge. You will learn, you will curse, and in the end you will experience the joy of having completed a seemingly impossible task. Some good magnification, a steady hand, high quality tweezers and a fine tipped soldering iron are a must. A multimeter with a diode tester is also really helpful. Great kit, fun way to work on SMD soldering skills. I wound up having to order a few spare 0201 LED's from Digikey, but the part #'s were easy to find and everything worked after learning some new soldering techniques! Having done very little SMD work, this kit provided some challenge, especially on the 0203 components. 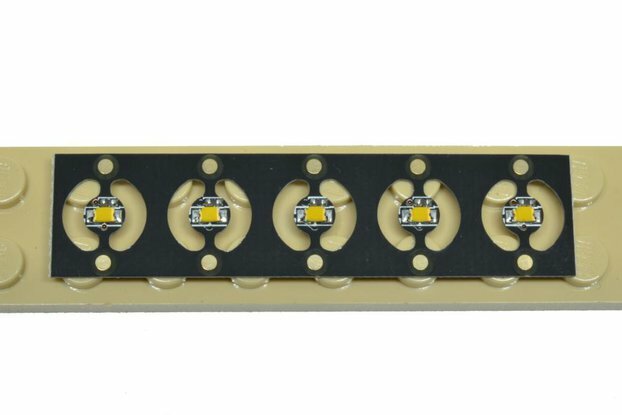 It's a shame that 0102 LEDs aren't available, because that would complete the horror! I think the SMD - Challenge is a great project. The delivery was very fast and I have learnded a much about soldering and the smd - components. All in all i gave a positive feedback for this project. This is a must have kit in my opinion. I have done a fair amount of smd kit assembly 0603 is the smallest I have ever attempted. 0402 was OK but 0201 was torture . This will definitely be a challenge but success is worth it! The PCB is well designed with good pads for soldering to and nice test-pads as well. The only issue I found was that the hole for the pin is close enough that the pin can short out against the battery if the pin is soldered in place and the battery is fully inserted. The product is great. When I picked up the 0201 LED with my tweezer it slipped and it shot away to a place and I ould never find it back. I failed the SMD challenge, but it was fun. I enjoyed assembling this kit. It's a good idea to order the spare parts kit if you haven't worked with very small SMD components before. Battery not included, so you'll need a fresh CR2032 battery. If the LEDs seem a little dim, and you've tried everything but the blue 0201 LED still doesn't work, try another battery or a regulated bench power supply. The first battery I tried was old stock, and it didn't have enough voltage to light the blue LED. Be sure to join the 0201 Club when you get your kit working! Great product. Just as described. Lost all of the smallest components. Had a blast putting together and brushing up on my soldering skills. All the needed components are included (for some there are even spare ones if you lose/destroy one), sorted out so it is very straightforward where they need to go. Also the ATtiny is pre-programmed, so you don't have to bother doing that, just grab the solder iron, and rock-and-roll! The documentation is also very helpful if there are things which are unclear. The shipping was quick, with tracking included. 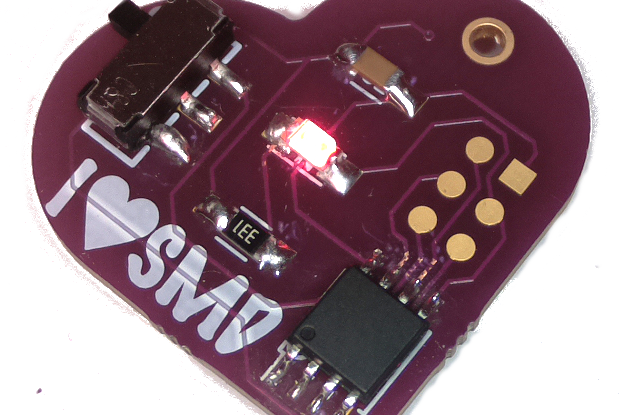 The SMD Challenge, though very frustrating, was fun. I basically proved my hand-soldering skills are only as good as I knew they were already. I knew I wouldn't have any issues down through 0603, as I've designed personal circuits that used parts down to that size. I was so hoping my 0402 skills would have been decent and that maybe by some miracle I could do 0201. The resistor on the 0402 I got soldered OK and while at first glance the 0402 LED looks OK, the LED didn't work. I thought perhaps I just installed it backwards, since the markings are so different on each LED and that particular one was marked on the bottom of the part, meaning you can easily flip it backwards when placing it and there's no way to easily verify it from the top (apart from trying to see the die itself). But after probing the test-points and looking at it closer under the microscope, it seems that I actually damaged the LED with too much heat while soldering it. And the 0201, well, I got really really close to having it soldered. I thought it was actually in place, but it wasn't and popped loose and... well, I lost it. Those are so tiny you can hardly distinguish the part from a rogue solder splatter speck on your workbench. Thank goodness the kit didn't include a 01005! 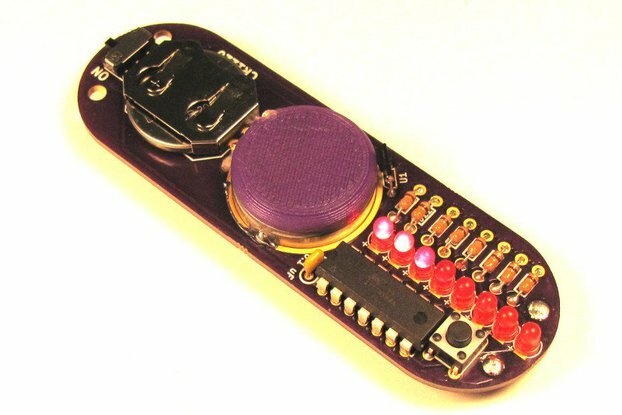 Very fun kit and very useful to see if you are able to hand-solder those small parts or see what it would be like to try, without having to make your own board. Great job Ken on assembling and delivering such a fun kit! 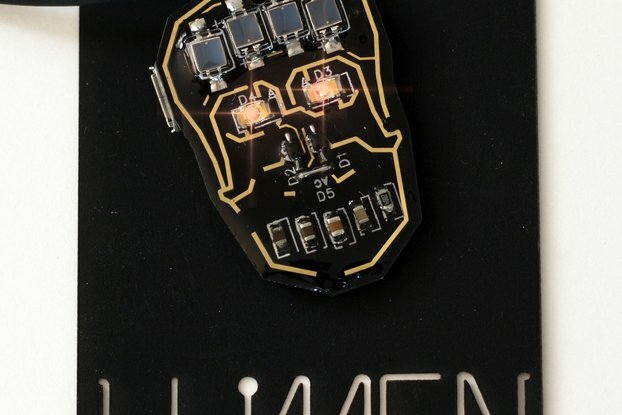 I had been watching this project on Hackaday.io since it was first posted, and when I saw the kit had been listed on Tindie I ordered one immediately. It arrived quicker than I expected, and I started trying to assemble it as soon as I could. The 1206 and 0805 parts went smoothly, the 0603s weren't too bad, and the 0402s were easier than I expected. The 0201s proved to be too much for me, with quite a bit of swearing while soldering the resistor and so many attempts to solder the LED that it ended up falling apart. I'll be ordering a few more LEDs on my next parts order to see if I can succeed on the second or third try, but I'm honestly not too hopeful. All in all, I had a delightfully frustrating time, and it was a lot of fun to see how far I got before I failed. The only documentation problem is that most of the datasheet links on the Tindie and Hackaday.io pages don't work for me, either loading forever or giving an error message. The part numbers are all there though, and pasting them into Octopart works fine of course, so it's not really a big deal. EDIT: I successfully soldered the 0201 LED on the third try! Also, the datasheet links seem to work now, so I gave back the missing star for documentation.